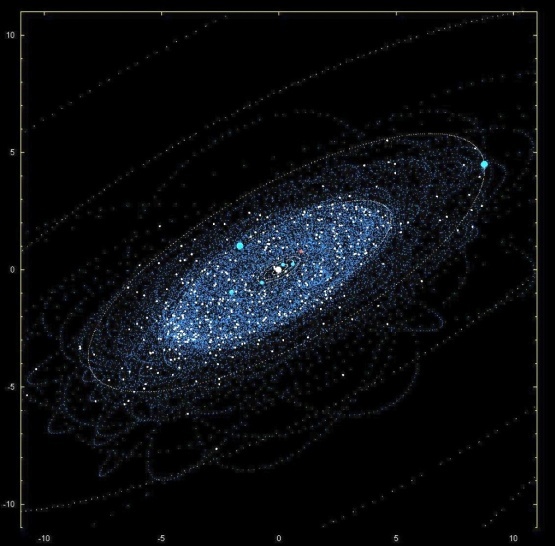 Digital algorithmic images were generated of the positions of known and reachable and accessible potential water objects of the solar system. A digital filtering algorithm strongly selects the low gravity objects. Only the low gravity objects are considered accessible in the sense of extractive mining. These first images display the exact location of the points of light that would be seen if an observing device were located somewhere near to but outside the solar system ecliptic plane. 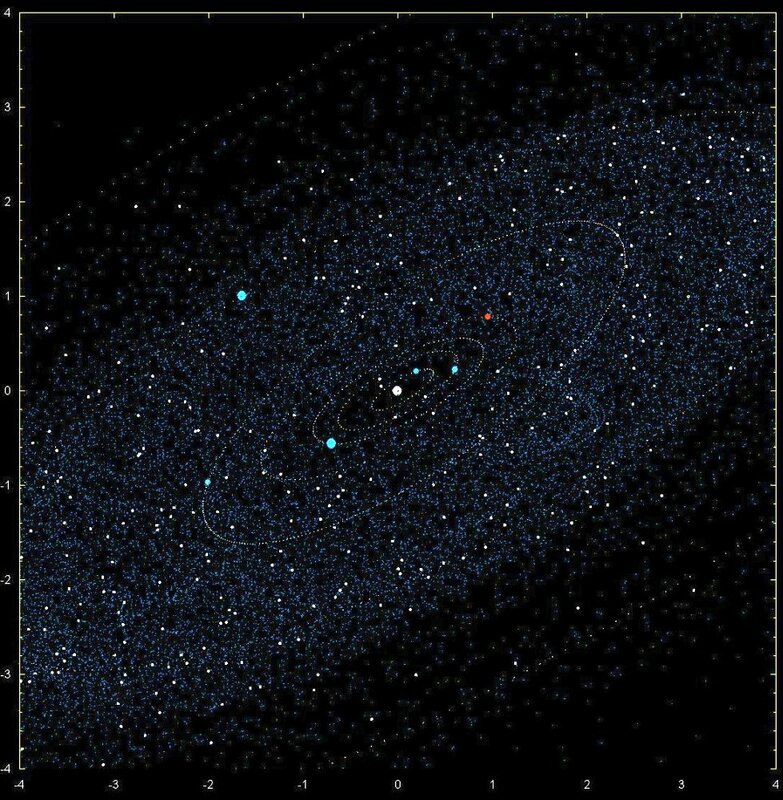 Using ephemerides and other descriptive digital data, the algorithm selects only the periodic comets (both known and lost) and the first ~ 1000 largest near earth objects (near earth asteroids). The effect is similar to analog telescope observations in the deep infrared using at least meter-sized telescopes in space. The display is similar to color mapping hyper-spectral images into the human visible spectrum. Medical CAT scans and MRI are also types of digitally algorithmic hyperspectral images. Some of the planets and their orbits are included to provide reference. The size of the objects such as planets is proportional to their "algorithmic brightness." A planet brightness and color are determined, for example, by the gravitational potential well that can be used in Oberth maneuvers, such as the Jupiter and Saturn. Another brightness standard is the cultural value for eventual human habitation, such as Mars and Ceres. Similar to analog telescope pictures of distant stars, the digital objects are all points of light whose apparent size is a function of "brightness." 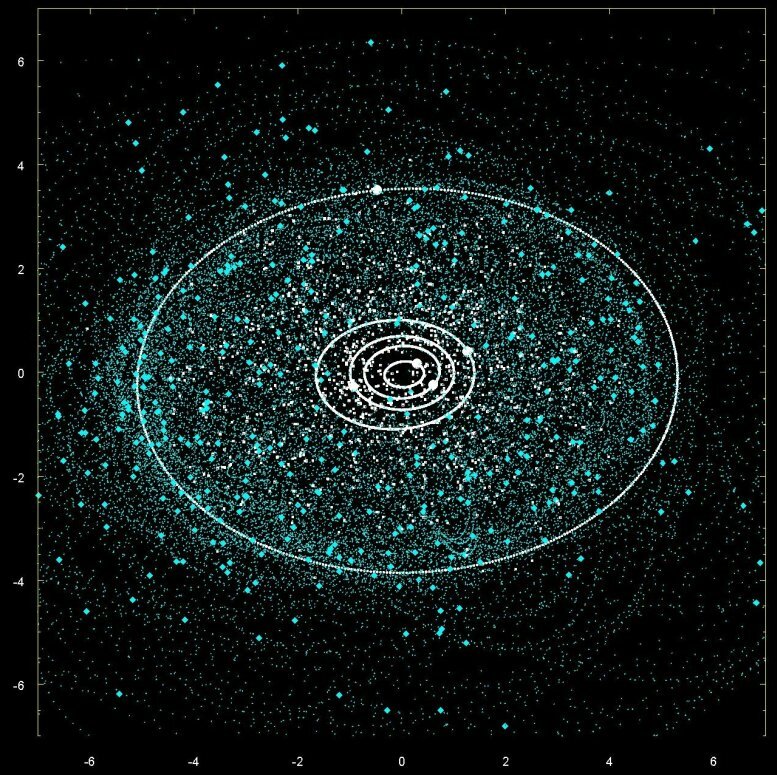 The periodic comet orbits are included as dots with equal time between the dots, and the dots deliberately not connected together, according to Sykes. Observations by Sykes et al. during the 1990's showed dust trails in the far or deep infrared as part of orbits of some neo's. The equal-time dots provide an approximate probability density proportional to the chance of finding a live or extinct periodic comet or dirty permafrost object in the region. The digital algorithm filters in those near earth objects that would be large enough to be of economic value. The magnitude of 18 or smaller would imply a size of 1/2 to 1 km or larger. Current knowledge of neo properties suggests that of order 40% of them will be friable and hydrated to an extent that heating to 300-500 Celsius will release the expected 5% to 25% water. The criteria is based on the assumption of up to 5 units of water to deliver 1 unit of water, net, to a stable parking orbit around Earth such as L5. Assuming the sale price is constrained by economics to no more than $100 per kilogram, the neo size constraint results in objects whose value would each at least exceed USD $ 1 Trillion net to L5. 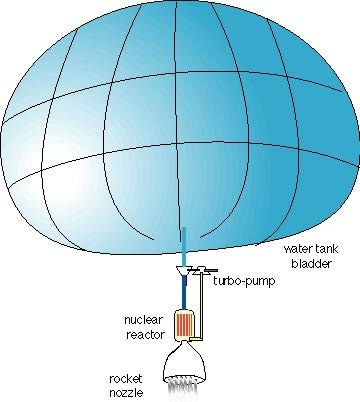 Water is rocket fuel ore, and can be used directly as rocket reaction mass ("rocket fuel") in steam rockets, after being cleaned. The unexpected surprise is the visual impact of such a large, apparent swarm of economically valuable objects. Unappreciated until the images spoke our human emotional language, the discovery is of the key item that was missing and without which the Laws of Physics prevented us from occupying th solar system: massive amounts of reaction mass, to satisfy momentum conservation when accelerating in a vacuum. giving a speech the modern way. This document is "scratch paper." but not now, too bad. but of the solar system. 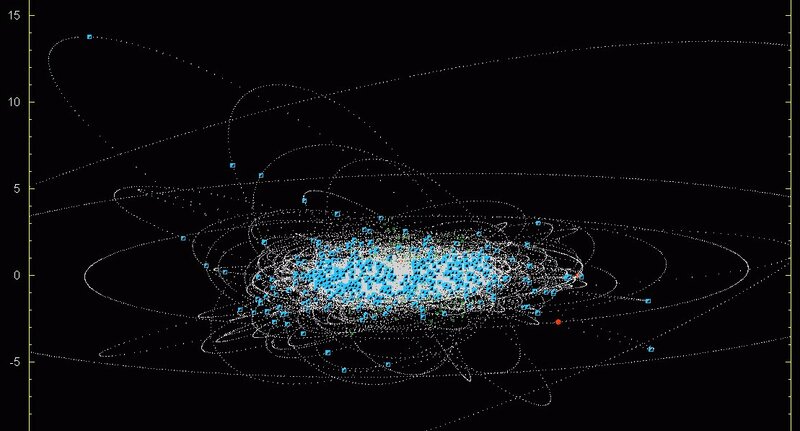 Water Objects of the neo solar system. You are here: at the third blue planet from the Sun. 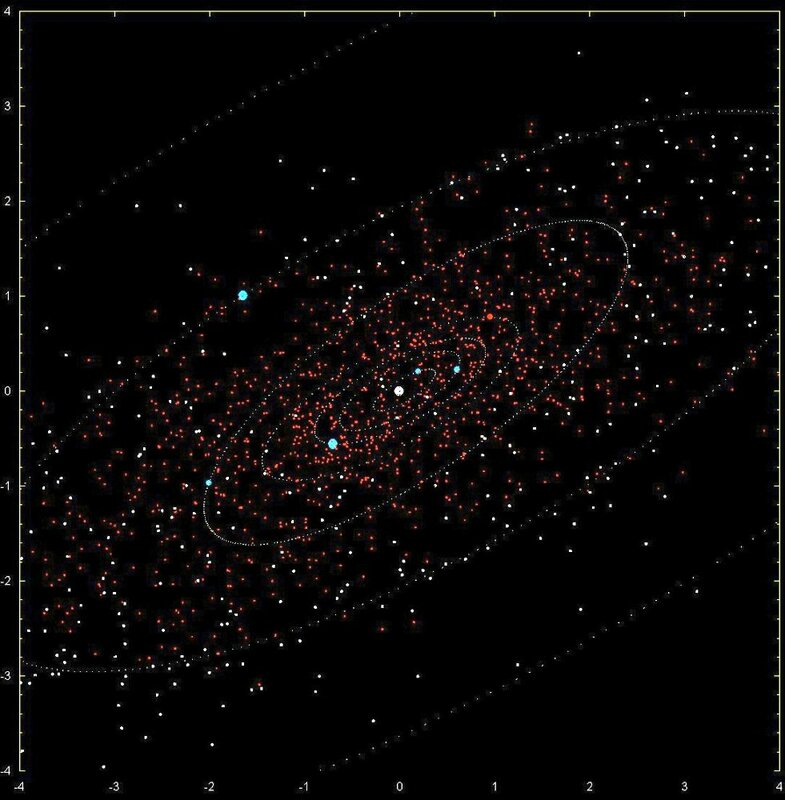 The red stars are the thousand biggest near earth objects of the solar system. Forty percent are expected to have some kind of water. Mars, the 4th, a red planet. and water ice recently observed on its surface. 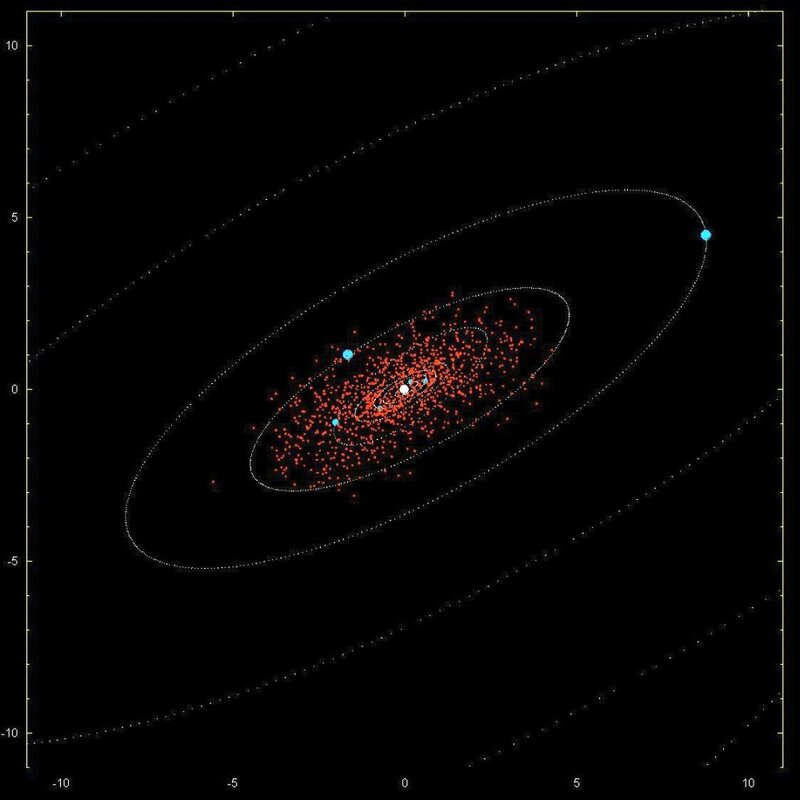 "First views of the near-earth-object solar system through a digital algorithmic hyperspectral telescope with multidimensional filters." delivered back here to Earth orbit are any good. to our gas station across from the moon. accessibility filter: neo mission delta_V ~ "reasonable": When pass/allow filter used, under 4000 m/s to return from Earth-Moon L5; P/comet delta_V under 6500 m/s. or Ceres, a little water planet just past Mars. the Mars Nazi's kept shouting "Mars! Mars!" we want to be like SuperMan. that my wife could toss the car over the house. 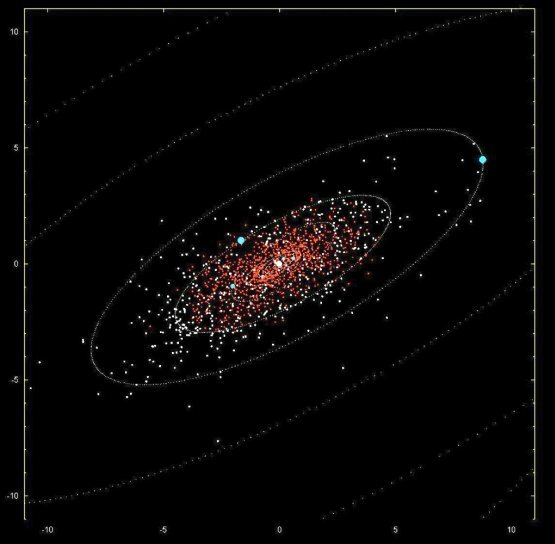 During the last dozen years about 7000 new near earth objects have been discovered by "neologists". Less than about 300 neo's were known during 1999 when we took a hiatus from working on this topic. Digital camera electronics enabled the discoveries. The computer takes digital pictures of the sky though a computer-pointed telescope and picks out those things that move fast with respect to the background stars in the sky. Those things are then tracked intensively. They were looking for objects that might crash into Earth. The low gravity enables affordable landing and launches, and launches of 1000 tons payloads by relatively small rockets. Instead, the neologists don't know it yet, they discovered about 1000 objects easier to get to than the moon. When calculating the economic value of the easiest approximately 100 of those would be worth, an interesting answer happened here. It's like an oil field in space. The scale is in Earth-Sun distances, AU. the day we started this neo solar system project. The view is a 4 AU plus/minus wide projection of the solar system, tipped 60 degrees from a normal to the ecliptic and then 30 degrees rotated left. This lest us see the entire accessible formation, the orbits of which extend to just past Jupiter. "net" means with enough propellant left over to return to the neo and get more. A rather well known space geologist ( "neo-logist", Dr. Gene Shoemaker, deceased) asserted during the mid 1990's that up to 40 percent of the neo's have between 5% and 25% water, are crunch-able (= friable) clay-like objects, and most of the water can be "cooked" out of them by just heating them at self-cleaning oven temperatures (~ 300 C). Was he right? We can not believe until our remotely piloted vehicles go there and analyze them to find out. Recent data seems to suggest Gene heard it first and was telling all who had a reason to care. He told Anthony, then at DOE. Anthony would send his Avatars instead, because he likes it here. Each Avatar costs about $500 Million, delivered to neo. All the neo's and comets shown have low enough gravity that relatively small amounts of rocket reaction mass, ( " rocket fuel " ) would be expended in a launch of rocket fuel or other payloads. Gone. Mostly too hard to get to. The white stars are the comets that repeatedly come back. I could toss a ton a hundred feet. and tar pit flavor dust. Homo Sapiens is practically blind. We don't need the lights. We can see deep deep infrared. and the sky would be full of these near earth objects. Just the big neo's, with 11 AU window. Saturn is the upper right blue planet. Jupiter is the next closer one in. Then Ceres is in the middle of it. Mercury, Venus, Earth and Mars can be seen with difficulty as blue or red dots. It's comet dust. It seems to be corralled inside Jupiter's orbit and seems to end just inside Mars orbit. of where the water things are. because of all that comet dust. 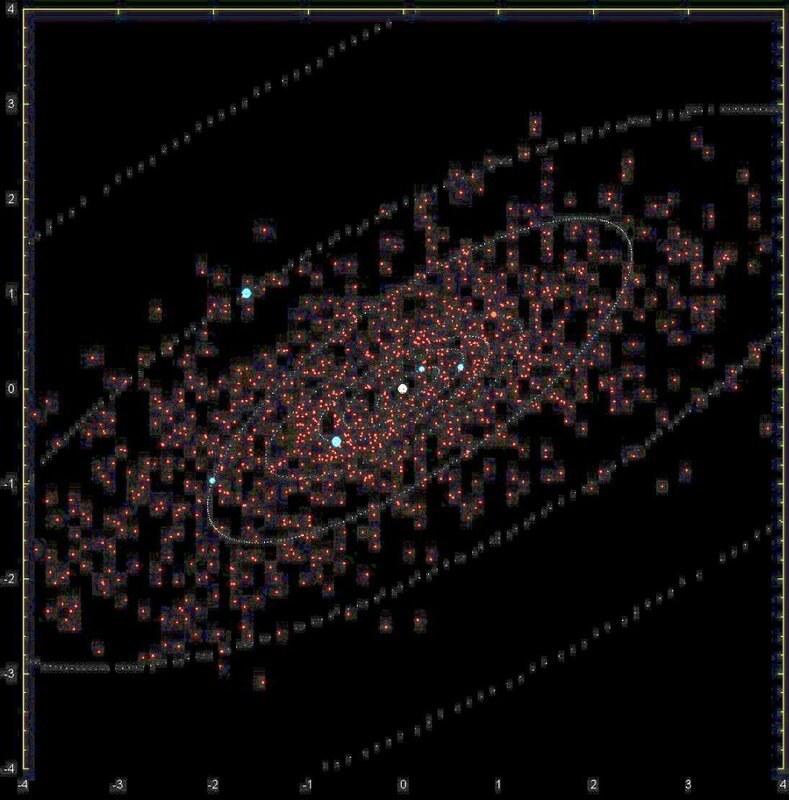 The periodic comet orbits are plotted as points with equal time between orbit point dots. "see" the chance of finding a water-ice permafrost object in any given region. who suggested we plot it this way during the mid 1990's. Notice the "donut" starting at Jupiter's orbit and ending somewhere between Earth and Mars orbit. The first observation of this was made by Thomas Larson of the Idaho National Laboratory of the US Department of Energy, mid 1990's. 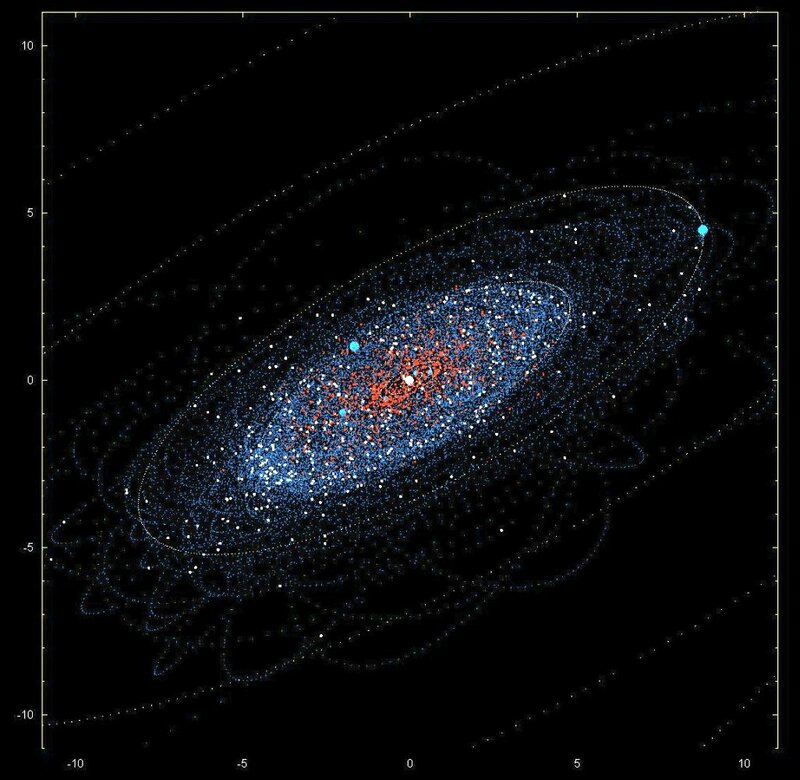 The water donut stars include the periodic comets and their orbits. We live at the edge of the donut hole in the center. A view from past Neptune, of a 22 AU wide projection. We included the "lost" P/comets because their dust and stones are there smeared near and throughout their orbits, somewhere. This is the same picture as above it, but with the actual position of the periodic comet white stars included. One might imagine that the apparent concentration of comets and dust at about 60 degrees from Jupiter represents a dynamic Trojan formation. One must ask Sykes or other neologists if that is real or just figment. It seems that Jupiter herds the comets to inside its orbit. Maybe Mars and Earth herd them inside their orbits as well, where the sun heats the water away and leaves just mineral rocks. This is speculation. Water is extracted from comets by heating permafrost to 1 Celsius, vaporizing the water. Water is extracted from friable objects by roasting to ~ 300 Celsius to cause dehydration reactions, releasing steam. Non-trivial issues related to condensing water in alsmot zero gravity, foaming, and removing disolved salts and other contaminations require precise knowledge of actual object properties to solve. Further processing such as electrolysis and cryogenic liquefaction to produce liquid hydrogen, and/or liquid oxygen can incur orders of magnitude higher complexity and cost. when you are coming and going. You are here, near the center. That's our neo solar system. How do you get the water out? her web and spindly legs holds it tightly in her grip. from its massive neo body. are the largest 1000 near earth objects. Some are crushable chunks that give off steam when you roast them. The blue white dust are what you find along a comet's orbit. The same as above now filtering in the 1 km or greater sized near earth objects. The red stars are the largest ~ 1000 neo's. Comet dust of the neo solar system. featuring Ceres, the blue "planet" dot at -1 vertical, -2 horizontal. with planets and sun only for reference. Ceres, at -2 x, -1 y, was recently observed to have water ice on its surface. It has low gravity (~ 1 / 36 that of Earth). Launches can be reasonable using Ceres water as rocket reaction mass or for rocket fuel. The background, blue fog brightness is also approximately the probability density of finding a water-ice object in that region. to go to their moons and back. try 18 months in a cramped, stinking porta-potty space ship, with a crew that is really starting to get on your nerves. 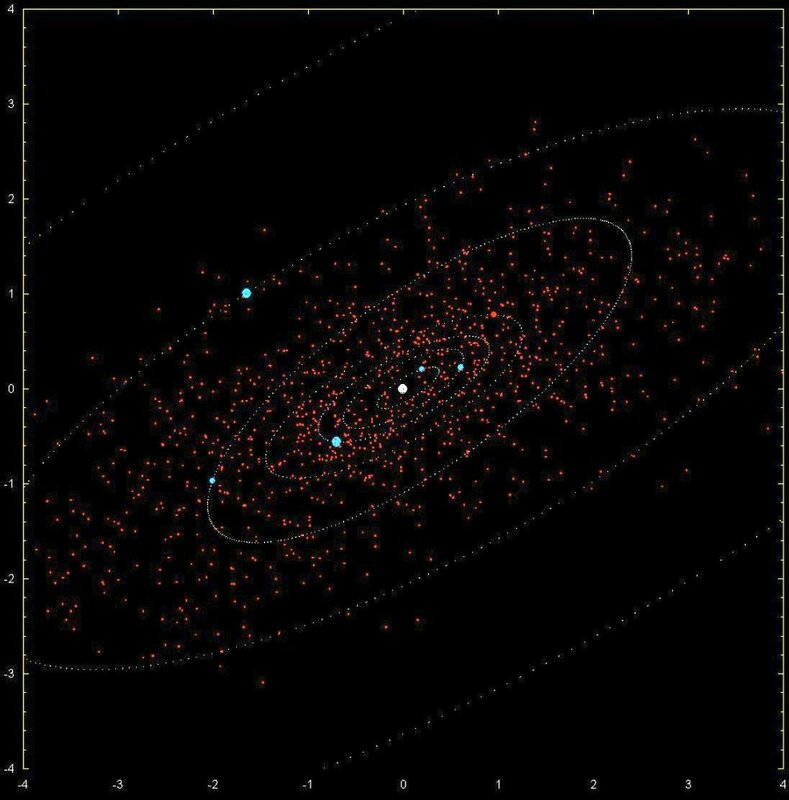 Algorithmic filtering shows only the repeating comets and their orbits. The red object is Uranus, and the red one above it is smog laden Saturn, as references. Close up of just neo's, no comets. and digitally filter to select just neo's. water candidate near earth objects for 12 April 2011, enhanced. at approximately -0.6 vertical, -0.6 horizontal. 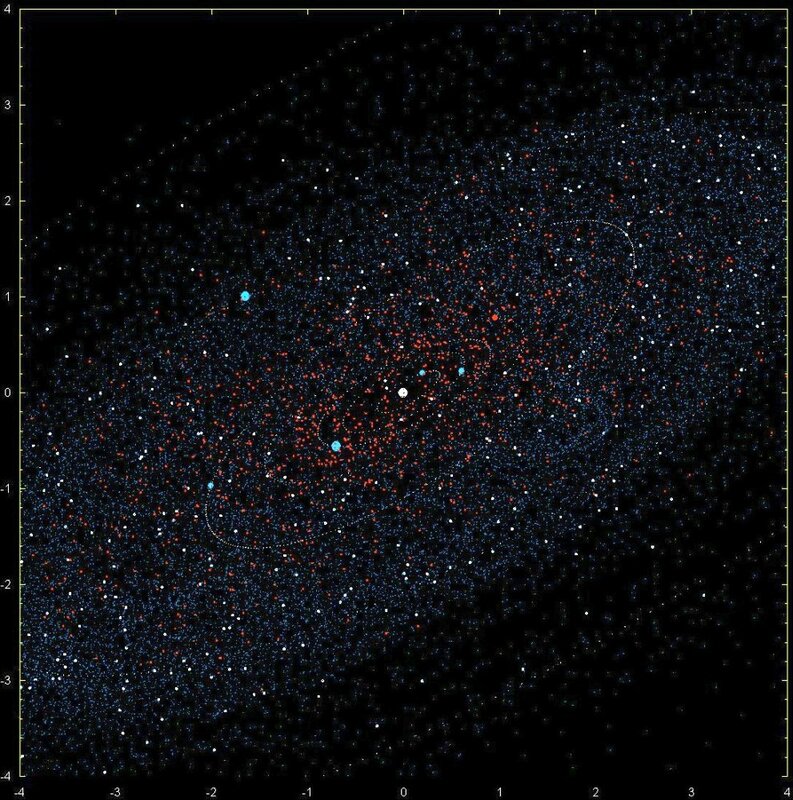 neo's enhanced to show the probability density of $ Trillion objects considered "near earth". Some significant fraction are accessible using a neofuel space tanker. I would see the sky full of things. would likely be rocket fuel ore.
"This is what I see. and a digitally algorithmic hyperspectral imager. All that stuff is money to me. Sun: black dot in the center. We don't yet know why there appear to be concentrations and gaps along Jupiter's orbit. can not see the cool dim glow of heat. smash into Earth and end it all. Close up of the water-objects candidates in the space near earth. We can not charge customers very much, or they won't buy it. which is about 50 times less than current price. Water is rocket fuel ore. This is just scratch paper. We are changing it all the time. through "digitally algorithmic hyperspectral eyes"
that filter in favor of gas stations in space. It is just a draft, our scratch paper. I also put it here because it was exciting. Expect colleagues and friends to see it. to enable us to occupy the solar system. when accelerating through a total vacuum." and become a space faring nation. It is a law of physics. we can travel the solar system. we could not get on and off the moon. the laws of physics demanded be there. we can not go anywhere. That was my universe before 12 April 2011.
you have the reaction mass to make it go.
" digitally algorithmic hyperspectral imager " ? Water is the missing reaction mass.